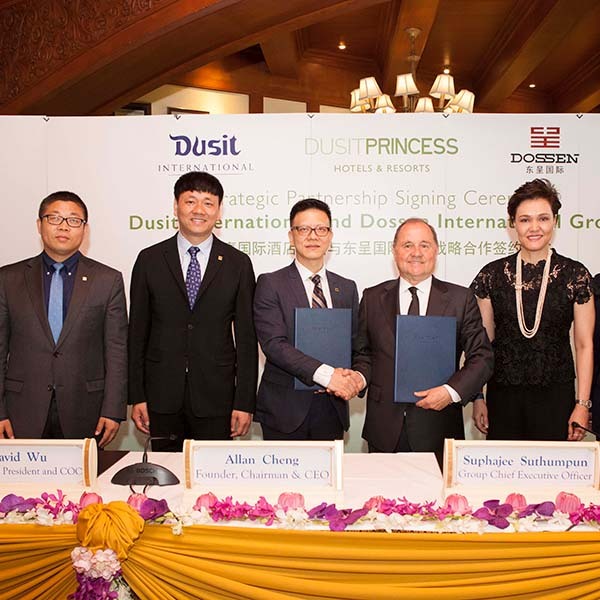 May 23, 2017 – Thailand-based, global hospitality company Dusit International has signed a strategic partnership with Dossen International Group, one of the fastest growing hotel groups in China, to operate and develop DusitPrincess resorts and residences in China. Dusit International was founded in 1948 by Honorary Chairperson Thanpuying Chanut Piyaoui, whose ﬁrst hotel was the Princess on Bangkok’s New Road. Today the company is a leader in hotel management and education and comprises a unique international portfolio of distinctive hotels and resorts operating under four brands: Dusit Thani, dusitD2, Dusit Princess and Dusit Devarana. The company currently operates 29 properties worldwide and has 45 confirmed projects in the pipeline in key destinations such as Australia, Bhutan, China, Indonesia, Kenya, Myanmar, Oman, Philippines, Qatar, Saudi Arabia, Singapore, Thailand, Turkey, and UAE. Dusit International also operates the signature Devarana Spa and has a fast-growing Education Division. The latter, established in 1993, comprises Dusit Thani College, which offers vocational and postgraduate hospitality degrees at campuses in Bangkok and Pattaya; Le Cordon Bleu Dusit Culinary School; and the recently opened Dusit Thani Hotel School, which is Thailand”s first hospitality school based on the ASEAN Common Competency Standards for Tourism Professionals.